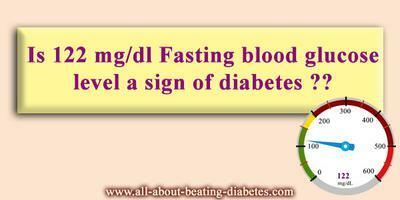 Is 122 mg/dl Fasting blood glucose level a sign of diabetes ?? Is this dangerous or do i have diabetes?? As per your description, I see you are overweight and on diet to improve your weight. I suppose your diet is very poor in sugar and carbs. In such circumstance, when you suddenly measured your random glucose and it was 173 mg/dl, I may say that in your case it can be normal. You have been on diet without taking any sugar with food and this has served as a signal to your body to release sugar from the glucose deposits in order to feed the tissues with fuel. This extra sugar comes from your fat that is metabolizing and sending glucose to blood circulation. Your fasting test was 122mg/dl normally it is 80-100. As you have been dieting I still think it's because of your diet too. So, in other words, such slightly high blood sugar levels do not indicate you have diabetes, neither prediabetes. Your fast glucose test has showed high levels because of your diet. Prediabetes itself even when diagnosed is not dangerous. You can take good control of it and prevent easily its progression to diabetes. I encourage to keep dieting and stay healthy as you are doing now because you do not have diabetes. Comments for Is 122 mg/dl Fasting blood glucose level a sign of diabetes ?? One good test to confirm the diabetic is HbA1c. It gives the last three months average blood sugar. Thank you very much for your valuable and so precise test review. As I always believed that type 2 diabetes is purely life style issue. 5 years back I was advused by Dr. to start glucophase as pre_diebetic case since my fasting glucose measured 168 dc/ml. However I stopped the medication and concentrated on my diet, exercise and meditation and now my random sugar reeads 123. I thought I will share my experience so may help. Thank you for following us and decided to share your experience. I hope other diabetic readers will follow your example and have the same success as you. My blood sugar in Fasting is 122 and Post lunch is 100. Can you please suggest. Your fasting blood sugar of 122 is a bit higher than the normal range. Post lunch blood glucose of 100 is within normal range. - Foods/drinks you have consumed the night before? - morning hormones (depending on the time you did check your blood sugar)? - should also rule out nocturnal hypoglycemia. Do measure your blood sugar at 1 a.m, 2 am and 3 am to check it out. Discuss this further with your caring doctor.